Translated from the French Map on lining paper. Notebook format. 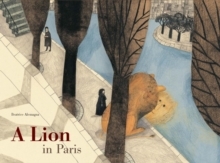 A Lion in Paris is widely regarded as the most accomplished book by multi-award-winning children's author/illustrator Beatrice Alemagna. It tells the story of a lion who, bored by his rural life in the savannah, seeks excitement and opportunity in the city of light. On arrival in Paris the lion is disappointed to find that despite his size, people barely pay attention to him, not even when he lets out a ferocious roar on the busy Metro.